Maybe you are not keen on making your holiday table too Christmas-y, but you still want to make the table seasonal - just in a more quiet way. 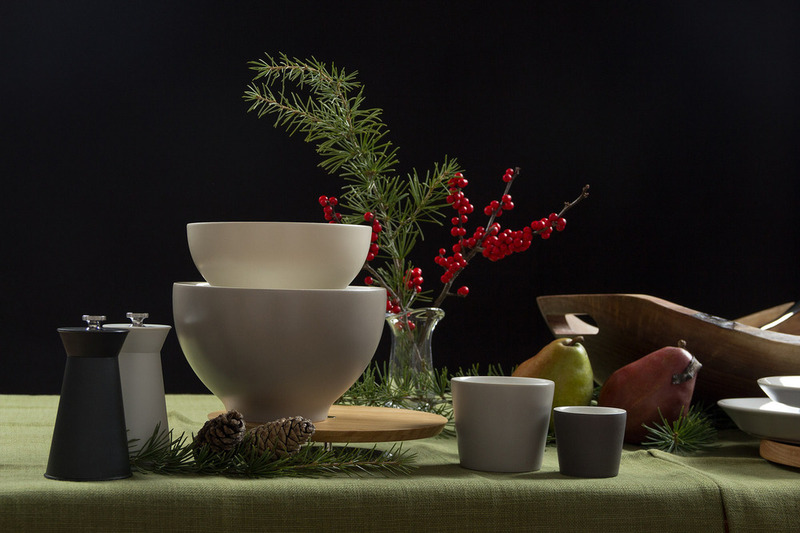 This setting, featuring the Alessi Tonale dinnerware collection has some holiday elements without being "too much." The clean simplicity of the tableware allows the eye to appreciate the texture of wood and branch elements. If that sounds like your kind of table, then Alessi Tonale dinnerware is perfect for you. Even people who are not big fans of modern style can appreciate the versatility of Alessi Tonale dinnerware. It does not shout. It presents gentle and simple modernist shapes and earthy, subtle color tones on the exteriors of the pieces. Alessi Tonale can be used in a totally modern setting, or put together with natural accessories to add texture like in this setting, to make an intimate ambiance for a holiday gathering. The inside faces of the dishes are off-white, so anything you put on them looks great and that make this dinnerware versatile and suited for everyday dining. In this tablescape, you see the green color of Libeco Blackfriars napkins as the background, but if you are looking for a tablecloth in the same color, you can use the Libeco Polylin tablecloth in Grass Green. The Tonale plates are layered on wooden boards, which are also a part of the Tonale design project. Here, I used them as a kind of small charger. The smallest porcelain plates can double as a butter plate or as a coaster for the tumbler. 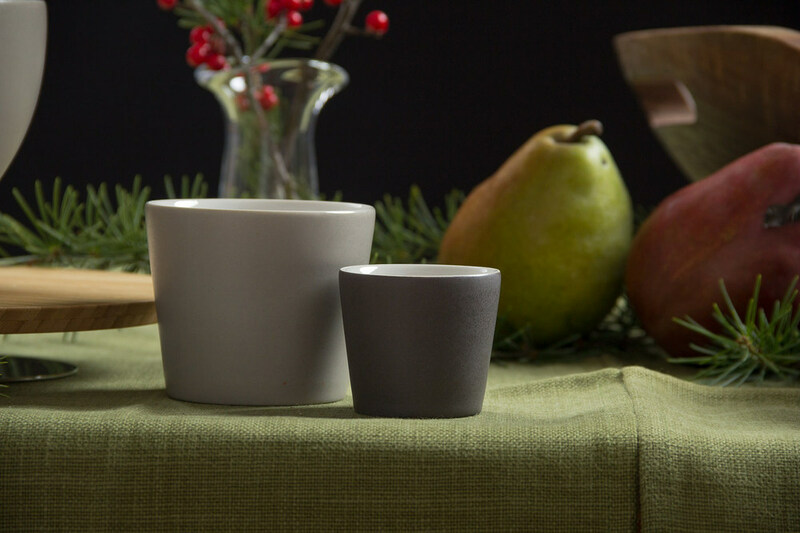 The little cup can be used as a sake cup or as a dish for condiments. The Tonale dinnerware series also includes glassware, like the carafe and stemless glasses shown here. You throw some cedar blanches and a couple of pine corns from the backyard on the table, and you will have a perfect holiday setting in front of you. There is no flatware shown in these photos, but I recommend Sabre Aquarelle (my first choice) or Sabre Nature flatware patterns to keep things earthy. The other items used in this photo shoot are as follows: Spencer Peterman Oval Harvest Bowl with handles, Simon Pearce Barre Bud Vase, Alessi Mediterraneo Salad servers, Alessi Ape Cheese Board and the Alessi Pepe Le Moco Mills. Happy holidays! Guest Blogger, Table Designer: Toyoko S.
Guest Blogger, Table Decorator: Toyoko S.